Identification: Upperside is glossy dark brown with small transparent white spots on the forewing and 2-3 white spots on the hindwing. 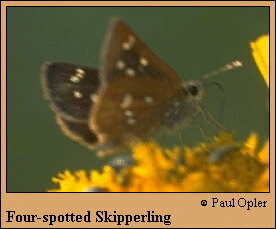 Underside is reddish brown with forewing spots repeated and 3 silver median spots on the hindwing. Wing Span: 1 - 1 1/8 inches (2.5 - 3.9 cm). Caterpillar Hosts: Not reported; probably grasses, rushes, or sedges. Habitat: Moist woodland openings with lush vegetation, meadows, and ravines. Range: Central New Mexico and central Arizona south to Mexico. Conservation: Populations need to be located, monitored, and their conservation needs assessed.